Most damselflies hold their wings upright above their bodies when they land, as this ebony jewelwing (Calopteryx maculata) is doing. This male has all-black wings and an iridescent green body. Females are similar but have a white dot at the tips of their black wings. This damselfly perches on a leaf behind Mill Pond School, watching for insect prey to ambush. Its bulging eyes see in all directions and notice the slightest movement. It can’t walk because its legs are too close together, but it uses them to capture prey. Long spines on its legs form a basket under its body for grabbing and holding prey as it flies. Besides birds and butterflies, another group of creatures is fun to watch in the summertime – the dragonflies and damselflies. Our streams, rivers, ponds and swamps make Westborough a good place for them. If dragonfly- and damselfly-watching seems like a strange idea, it’s probably because many of us barely notice dragonflies (Anisoptera) and damselflies (Zygoptera). These large, familiar insects zip past us occasionally, but they don’t bother us. They’re not interested in us. Instead, they’re after other insects, including ones that do bother us, such as mosquitoes and flies. For this reason they’re sometimes called mosquito hawks, and they’re good to have around. If you pause for a good look at these great predators of other insects, you’re likely to notice a lot of color. Reds, blues, greens, and golds often decorate their bodies, which can shimmer with iridescence. These colors probably help them attract mates. Males and females often sport different colors or different markings. How can you tell a dragonfly from a damselfly? They are closely related, but it’s usually not hard to tell which kind you’re looking at. They often sit still on a leaf or stick, giving you a good view. Dragonflies rest with their wings spread open, like airplanes. In contrast, most damselflies rest with their wings folded upright above their bodies. Damselflies are also usually slimmer and more delicate-looking. 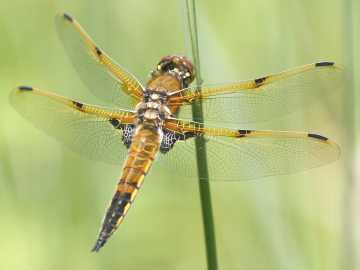 Where can you find dragonflies and damselflies? The best place to look is near water. They’re there in two different life stages – as the adults we commonly see flying around, and as immature swimming forms known as nymphs. The adults are busy hunting other insects (and sometimes each other) and finding mates, and the nymphs are also hunting insects – but in the water – and eating and growing. Much as butterflies come from caterpillars, so dragonflies and damselflies come from nymphs. Like caterpillars, the dragonfly and damselfly nymphs hatch from eggs and have big appetites. They devour all sorts of tiny water creatures, including the larvae of mosquitoes and flies and even tadpoles and small fish. Dragonflies spread their wings like airplanes when they’re at rest, like this female four-spotted skimmer (Libellula quadrimaculata). Dragonflies are strong flyers. They can hover and maneuver in all directions, thanks to wings that beat independently of one another and twist in flight. Some dragonflies hit speeds of 20 mph. One big difference, though, is that dragonfly and damselfly nymphs mature slowly and gradually into adults, instead of transforming dramatically (as a butterfly caterpillar does when it forms a case-like chrysalis around itself and changes into a butterfly). Dragonfly and damselfly nymphs slowly become more like adults as they grow and shed their old “skins” many times, going through several stages. This development can take months or even years. But their last stage has its own drama. When ready, a nymph climbs out of the water and clings to a suitable rock or plant. There it splits its old skin and the adult dragonfly or damselfly climbs out, leaving an empty shell behind. It spends the next hours in a fragile state as it pumps up its new wings and lets its new body harden and its colors intensify. If a bird, frog, turtle, or snake doesn’t pick it off, it finally takes to the air for its new adult life. New dragonflies and damselflies then move away from water and hunt elsewhere for a few days or weeks until they become sexually mature. For this reason, we also find them in gardens, woods, fields, and meadows. Later they return to water for the all-important business of finding a mate and laying eggs for the next generation. Once you start looking at dragonflies and damselflies, it’s easy to see that there are many different kinds – different ones at various times throughout the summer, and different ones in different environments. Massachusetts has 166 different kinds. Here in Westborough we are fortunate to have a great variety of waters and wetlands. All watery environments aren’t the same from the dragonfly’s and damselfly’s point of view. Their nymphs need particular environments. Some need still, swampy waters, while others use lakes or ponds, or flowing rivers. 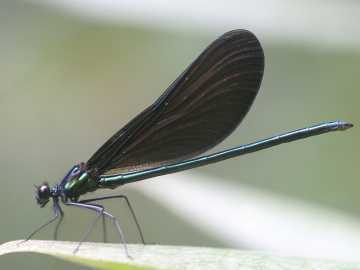 Others, such as nymphs of the ebony jewelwing in the photo, thrive in shallow woodland streams. Dragonflies and damselflies are also entertaining to watch. They’re wonderful fliers. Some dragonflies seem to fly like small helicopters, while some damselflies seem to flutter like butterflies. Near water, some males patrol and defend territories and court females. You might notice a male and a female coupled together for a while in a heart-shaped or circular “mating wheel.” Or you might see a male holding onto a female as they fly around together while she deposits eggs in the water – a way for a male to guard the female from other males. Nets can be useful, according to David Small of the Athol Bird and Nature Club. At a presentation in Westborough in June, he demonstrated how to catch a dragonfly or damselfly in an insect net, how to reach in and take hold of it without injuring it, and finally, how to release it afterwards. He pointed out that it stops struggling once it has been properly grasped, as if it realizes that it’s not going to be eaten. Kids and adults had plenty of opportunity to practice these skills during a short walk along the edge of Rogers Field, which borders Cedar Swamp. To identify dragonflies and damselflies, consult A Field Guide to the Dragonflies and Damselflies of Massachusetts by Blair Nikula, Jennifer Loose, and Matthew Burne, available from the Mass Wildlife headquarters off Milk Street. To see giant models of dragonflies and damselflies, as well as spiders, mosquitoes, flies, and more, check out the popular “Big Bugs” exhibit at the New England Wild Flower Society’s Garden in the Woods in Framingham. The exhibit runs through October.